The taste of the Bario Highlands is available on the lowlands now – but just in the city of Miri. IF one has a penchant for authentic Sarawak highland dishes, and just happen to be in Miri, then head for The Summit Cafe at Centrepoint Phase 1 Commercial Centre. Owner and cook Sally Bungan Bat, a Kenyah from Long Banga, Ulu Baram, operates the cafe, the only place in Miri, if not in Malaysia, that serves authentic Kelabit dishes outside of the tribal heartlands. Locals and tourists alike flock to her shop to sample the dishes and many are coming back for more. If one is familiar with the multi-cultural setting of Sarawak, one will perhaps wonder why a Kenyah is operating a restaurant that offers Kelabit dishes. 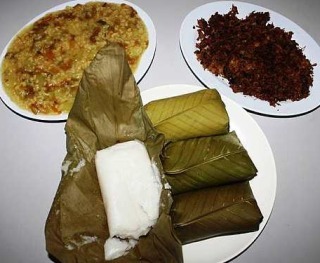 Kelabit dishes (clockwise from top left) bitter sabi vegetable, a meat dish and Nuba Laya (steamed mashed rice wrapped in Isip leaves). Well, Sally is married to Senior Police Officer Wagner Lisa Libat, 50, a Kelabit from Bario – and that explains it all! Perhaps serving Kelabit fare at the cafe is her way of proving her undying love to her husband. Tribal goodness: Sally Bungan Bat, a Kenyah from Long Banga, Ulu Baram, is the cook and owner of The Summit Cafe. Other vegetable dishes are dried bitter leafy vegetable (known locally as sayur sabi) cooked with mashed cucumber; Dure, a seasonal vegetable found in the wild in the Bario Highland; and Lanau (also popularly known among locals as Bario asparagus, but it has no relation with the asparagus family). Sally also incorporates the concept of organic cooking into her dishes by using only Bario salt, home-grown rice from the highland, wild vegetables, and even seasoning. For the last, she uses what she calls the “Bario ajinomoto”, which is made from special leaves normally used by the Kelabit as food enhancers.